The JH series offers the three most important features needed in steam traps for steam-using equipment: a large condensate discharge capacity, powerful automatic air venting, and the ability to drain condensate in high pressure / temperature applications. The use of special construction materials also makes this series perfect for processes requiring cast steel valves, even if pressure isn't of particular concern. The Free Float® moves up and down in response to the amount of condensate inflow, automatically adjusting the amount of valve opening and continuously discharging condensate. This ensures that no condensate accumulates inside the equipment. The surface of the liquid inside the trap is maintained above a certain level and condensate is continually discharged through the orifice. Even when there is no condensate flowing into the trap, the precision Free Float® securely seals the orifice closed. This minimizes steam losses during operation. In Free Float® type steam traps, the forces of the inlet pressure and the back pressure act in opposing directions, so Free Float® traps are able to operate normally even under 90% back pressure. This makes them ideally suited for processes with closed condensate recovery systems. 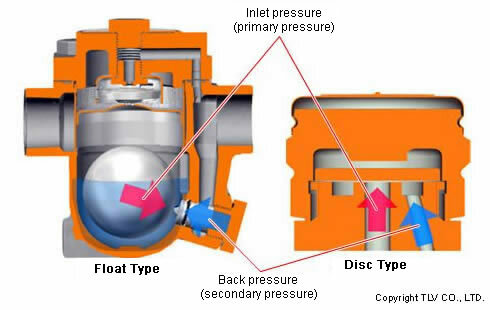 In contrast, disc type traps only have a 50% to 80% allowable back pressure because the pressures act in the same direction. When the steam trap is cold (before steam is supplied to the equipment), the X-element is in the contracted position, so its valve is fully open. When the supply of steam begins, air and condensate are released through this valve opening. Condensate is also discharged through the main valve opening (also known as the orifice) in the lower part of the trap. When the discharge of the initial air and cold condensate is finished, steam enters the trap causing the X-element to expand. By expanding, the X-element closes the valve where air is discharged. As condensate enters the trap, the float rises in response to the inflowing condensate load, and condensate is continuously discharged through the orifice. When hot air enters the steam trap during operation, the X-element immediately senses the drop in temperature inside the trap and automatically opens the air-venting valve, which rapidly discharges the air. After the air has been completely discharged, the temperature again rises and the air-venting valve closes. If there is no inflow of condensate, the float drops and is held tightly against the orifice. This seals off the main valve opening (orifice). Steam leakage is prevented at all times by maintaining a water seal over the orifice. Carbon cast steel and stainless steel bodies, a shape that maximizes condensate drainage and an anti-erosion design allow JH series traps to be used with confidence on high temperature, high pressure processes in a wide variety of industries.